From Gatorade baths, to billboards, to throwing out the first pitch at softball games, there is a spotlight constantly shining on the head coach of a major college football program. 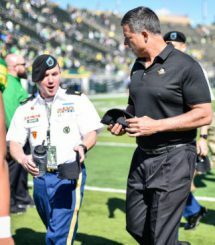 While he has embraced his role as a university ambassador wholeheartedly, the spotlight that Oregon Head Coach Mario Cristobal cares about most is the one he shines on his own team. 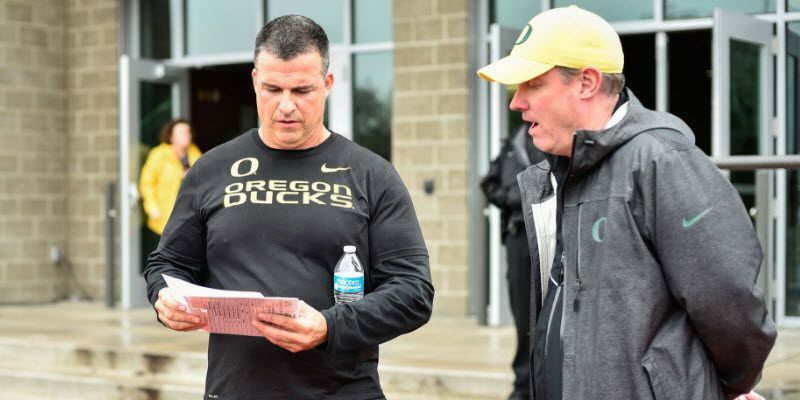 Cristobal enjoys his first spring game as the Head Coach of the Ducks. While much of game planning during the season involves scouting an opponent, there’s another, understated element of preparation that comes to the forefront during the off-season: scouting oneself. The best coach knows his own team inside and out. He is able to coach to their strengths while also identifying and preparing for their weaknesses. This off-season, while we keep an eye on our conference foes, let’s look in-house to see some specific areas where we can stand to improve heading into the 2018 season. Our penalty issues last season are well documented, and Cristobal has repeatedly prioritized turning this metric around. The question is, how exactly does he plan to do so? 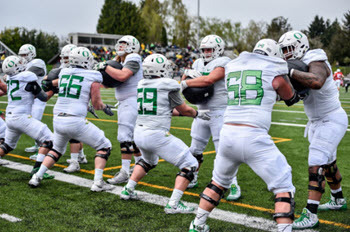 If his first spring is any indication, Cristobal is bringing something to Oregon that has been missing for many, many seasons: a focus on fundamentals. Offensive line running through drills. Duck fans, I can’t stress just how refreshing it is to have a coach who is dedicated to teaching the details and basics of the game to these young, impressionable players. It often gets lost in the ever-advancing world of recruiting and primetime televised games, but college football players are just kids who are still developing mentally, and thus, still learning the intricacies of the game of football. Yes, they are athletic phenoms with physical profiles in the top 1% of the world, but mentally, they’re still growing adolescents with frontal lobes that aren’t yet fully formed. Therefore, one of the most important things a coach can do is consistently educate players in the nuances of the game such as positional technique, footwork, hand placement, eye discipline, pad level, mechanics, etcetera. While it’s true that a 70-yard touchdown run cannot be accomplished without a runner who has some serious speed, it’s also true that the same run cannot be accomplished without all eleven players doing their jobs and playing with proper technique. If the correct fundamentals are emphasized in practice, there’s typically a pay-off on Saturdays. Cornerback Thomas Graham Jr. with good positioning. Unfortunately, the opposite rings true as well. If the details are neglected throughout the week, mistakes will transpire on game day. These mistakes often materialized as penalties this past season. If Cristobal continues to prioritize the fundamental, technical aspects of the game, we will not only see our penalty total drop in 2018, but we will see a much smarter and better-prepared team as a result. Defensive coordinator Jim Leavitt deserves all the praise in the world for the job he has done with the Ducks’ defense. The numbers speak volumes, but it only takes a simple eye test to see that this is a much more cohesive group. However, there’s always room for improvement. If there’s one area where this defense can stand to improve, it’s in the ability to prevent explosive plays. In 2017, we allowed 61 plays of 20 or more yards from scrimmage, and 31 plays of 30 or more yards. This ranked 76th and 92nd, respectively. Not ideal. While our defense was solid at generating tackles for loss and creating disruptive plays in the backfield, the unit was also exposed on the back end, as teams routinely gashed us with explosive plays. 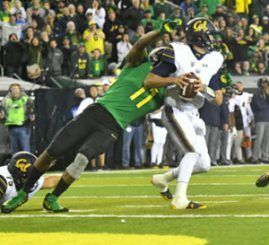 Justin Hollins demonstrates how disruptive Oregon’s defense can be in 2018. Under the previous regime, our plan was to be a “bend-but-don’t-break” defense, but it seems that we’re in for quite the opposite under Leavitt’s direction. Don’t get me wrong, there’s nothing wrong with employing an aggressive defensive scheme; in fact, for most Duck fans, it was a welcome sign to see our defense near the top of the leaderboard in sacks and tackles for loss. However, it is possible to be both an aggressive defense AND to play with eye discipline, gap integrity, and proper fundamentals—elements that correlate with a reduction in explosive plays. 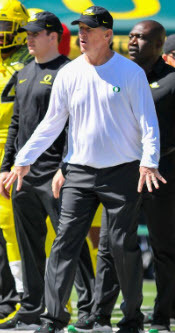 Jim Leavitt during the spring game. Look no further than two of the College Football Playoff participants in Alabama and Clemson. Each of them were excellent at preventing long gains while also ranking in the top 25 in tackles for loss per game. This demonstrates both their discipline and their disruptive capabilities. If Leavitt can channel his aggression and teach a young defense how to play under control, we will see yet another dramatic improvement from our defense this season. If we had played all of our games at home in 2017, we might have won the PAC-12. Yes, I’m exaggerating slightly, but the point is, at home, we seemed to consistently put forth an elite performance. Unfortunately, the same cannot be said of our road efforts. The Ducks looked like a different team when playing on the road in 2017. While we compiled a 6-1 record at home, we were only able to win ONE road or neutral site game in six attempts. Going beyond the record, however, the stats are absolutely mind-blowing when comparing our home games versus those on the road. At home, we out-gained our opponents 512.3 yards per game to 326.1, and outscored them 47.4 to 24.4. Folks, we weren’t just good at home, we were absolutely DOMINANT. Those numbers show that, firing on all cylinders, the 2017 Ducks could have gone toe-to-toe with any team in the country, let alone any team in our conference. On the road, however, the narrative changes. Our opponents out-gained us 419.3 yards per game to 357.7, and outscored us 34.3 to 22.7. While we were clearly dialed-in when playing in front of the Autzen crowd, games outside of Eugene proved far less fruitful. There are a number of explanations as to why we might have struggled so much on the road, but chief among them is the fact that we were simply a young team in 2017. 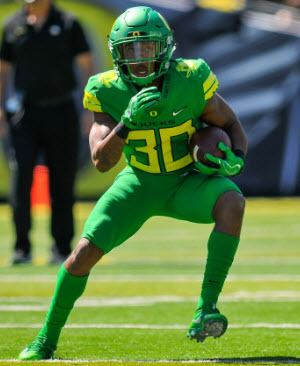 Young Ducks like Jaylon Redd gained valuable experience in 2017. If there’s one thing that can’t be taught, it’s experience. Time is the ultimate teacher, and there’s no way to simulate the euphoria and chaos of playing in Seattle in primetime or even in Las Vegas for a bowl game. Now, with most of the roster returning, we should see some of that wide-eyed innocence replaced by confidence and discipline. If we can grow into a more consistent team, regardless of where we play, we truly have the potential to be a contender in 2018. The arrow is certainly pointing up for Oregon football right now, and we have as good a chance as ever this upcoming season to make a deep run in the conference. There’s a fine line between winning and losing, and the Ducks’ improvement in the areas noted above may be enough to swing the pendulum in a green and yellow direction.